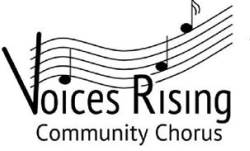 Voices Rising is the only inter-generational community chorus in Gainesville, Florida. Our singers are adults and youth ages 10 and up. Our repertoire ranges from classical to folk to show tunes. When we sing, magic happens! Voices Rising is a proud 1st place winner for video in the 2018 Kraemer Intergenerational Story Contest! The contest is sponsored by Bridges Together, a non-profit organization promoting intergenerational programming for older adults and children. Check out the winning video above. Thanks also to WUFT for featuring the contest and Voices Rising's holiday concert on their website. View the story here. We were honored to premiere this composition by Willis Bodine, Professor Emeritus of the University of Florida School of Music at our Spring 2018 concert. See the Chorus Archive for more photos and videos. Rehearsals are held Sundays 6:00-8:00 p.m. at Trinity United Methodist Church. ​Listen to Willis Bodine's interview with WUFT's Richard Drake ​featuring the piece Willis composed for Voices Rising, which was performed for the first time on 28 Apr 2018. Voices Rising was recently featured in the Gainesville Sun and on the Ilene Silverman Show. Click here to read the Sun article and click below to see the Ilene Silverman show video. Support VRCC while you shop! ​You can support VRCC any/every time you shop at Amazon.com. AmazonSmile will donate a percentage of all eligible sales made in support of VRCC. Just click here and shop as you normally would. There is no additional cost to you. We accept online payments for donations and member dues. Click here to pay dues or donate. Where in the World is Voices Rising? ​Chorus members have been taking their VRCC t-shirts on vacation. See our travel slideshow here. Check out the cover story on VRCC in the April 2014 issue of Senior Times Magazine. Voices Rising members were asked to complete the sentence, "When we sing together..." Read what they had to say. Friends of Elementary Arts thanks VRCC in this letter to the Gainesville Sun (2nd letter on the page). Read about Voices Rising's founding in the Gainesville Sun. The evidence is in: singing in a community chorus makes you happy. © 2013 Voices Rising Community Chorus. All Rights Reserved.